Tarot of the Cat People, A Traveler's Report was written by a single explorer to the Outer Regions, a vast area far, far away. Cats are the favorite animals in the Outer Regions, where they are revered, loved and even obeyed. Karen Kuykendall provides a fascinating insight into the stunning illustrations of the Tarot of the Cat People deck and reveals the secrets of the Outer Regions in all their splendor. I have read this book, a great many times, and it's now bent and earmarked every which way. 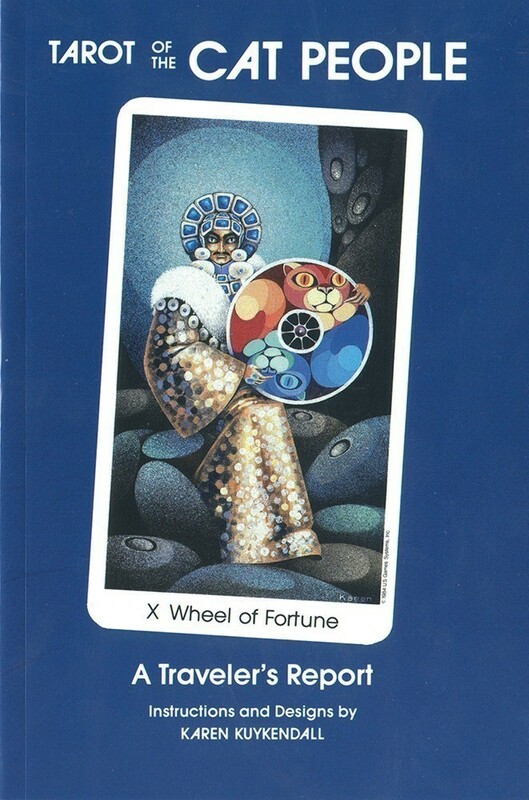 This book belongs to my first and one of my favorite decks in the entire universe. The book like the deck is heavy, and discusses a people that Kuykendall created to play out the story of the Fool It's highly political, and she does a great job of going into detail about the politics of each of the Cat People, and where they live on this distant planet, and how that colors their stature in their society and how that plays into the meaning of the cards. This is a darker deck with darker concepts, and the Cat People stare at you from the dark pages unsure of whether they are going to let you pass or eat you. I wouldn't recommend this book or deck to a novice, it's a powerful deck, and I recommend having this book if you're going to buy it.